Becoming all the rage, pink diamond engagement rings add a new twist to the traditional wedding ring with diamond. As with classic diamond ring sets various settings and cuts are available but using colored gemstones are adding a new flair that is growing in popularity. Traditional diamonds are colorless, it is their cut and shape that creates color effects based on how they capture the light. Colored diamonds are very rare and because of their scarcity are highly valued. A pink diamond offers a subtle color flair that helps accentuate the engagement ring that you are considering and creates a very desirable effect. Colored diamonds are highly desirable because of their subtle color and rarity. When hunting for the perfect gemstone for your engagement ring set, color is not the only consideration for finding value. 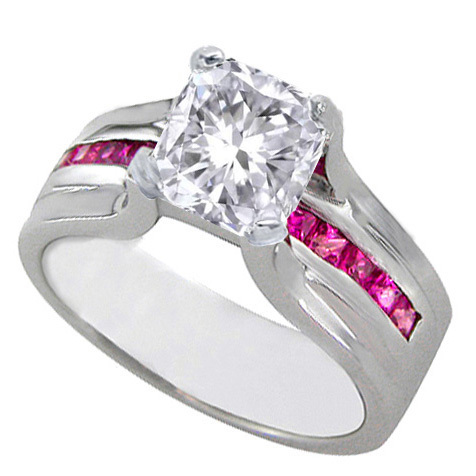 To start, you should look for a pink diamond that has a consistent color throughout. Following color you should still keep in mind the diamonds, clarity, carat, and cut. Your diamonds value will be directly dependent upon the 4c's of diamonds. The size of your gemstone is reflected in its carat. A larger gemstone does not always equal a more valuable diamond, as clarity, cut and color must be taken into consideration as well.